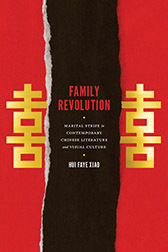 With Family Revolution, Hui Faye Xiao makes a significant contribution to recent scholarship on the cultural representation of marital strife in contemporary China. She argues that the representation of divorce in recent literature, film, and TV drama fashions a discursive arena for battling ideologies of family and marriage. According to Xiao, while these divorce narratives demonstrate a collaboration with the male-centered state and society in cultivating women’s wifely and maternal qualities as the cure for China’s ongoing family disintegration and social disconcertment, they simultaneously embody the resurgence of gender inequality and the tightening of social control over the individual autonomy of private life. Xiao is to be lauded for offering this thought-provoking volume, which analyzes “family” as a historically-situated and ideologically-mediated social institution with multifarious meanings vis-à-vis the postsocialist Chinese state-market-culture nexus. As Xiao keenly reminds her readers throughout the book, the dramatically changing familial practices are largely attributable to the complex reciprocity between the governance of Chinese neoliberalism and the formation of a new domestic culture. The family revolution is, as she rightfully notes, a “subjectivizing project” (182) that produces seminal positions of gender and class. Xiao offers a powerful feminist critique of the familial operation of affective labor in postsocialist China. Generally referring to work conducted to produce or modify emotional experiences that have collective regulatory power, the notion of “affective labor” has increasingly been applied to contemporary Chinese cultural studies (see, e.g., Lu 2007). Xiao contributes to this enterprise through a feminist reading that lays bare the discursive contestation and structural inequality within one of the most significant affective labor projects in postsocialist China—that is, the dissemination of male-centered family ethics through literary and visual cultures. The strength of her critique lies in her persistent questioning of the naturalization of gendered divisions in redefining sexuality, familial roles, and (inter)subjective positions in relation to the state and society. Chapter 1 deals with Chen Kexiong’s and Ma Ming’s early-1980s story “Return, Cried the Cuckoo” and its sequel “Flying Afar.” Set in late 1970s China, “Return” tells the story of Shi Ping, a married peasant from a remote village who later attends college in Shanghai and falls in love with an urban girl studying nuclear physics. Facing the difficult choice between his scientist lover and peasant wife, after graduation he eventually returns to his wife. The sequel discloses that Shi eventually divorces his rural wife and moves to the city for good. Xiao eloquently demonstrates that in the early 1980s transition from Maoist socialism to Dengist developmentalism, male writers such as Chen and Ma proposed a new developmentalist alliance of science and romance at the expense of the rural woman as the abject Other of Chinese modernization. She also pinpoints the symbolic and actual violence of the Cultural Revolution as a probable reason for the male-centered ideology of developmentalism. Chapter 2 continues the investigation of male literary narratives of divorce by exploring Wu Ruozeng’s Divorce (1986) and Su Tong’s “A Divorce Handbook” (1991), both of which feature male intellectual protagonists associating their divorce experiences with the fate of the nation. In Divorce, sociologist Li Bo’s strenuous, painful effort to divorce his wife turns futile, and he ends up committing suicide. Written in first-person narrative in the form of Li’s diary, the novel presents a male intellectual subject using his own divorce to challenge the 1980s power structure in an alleged search for liberal Chinese modernity. In “Handbook,” Yang Bo pays a large sum to get a divorce from his wife, who later refuses to grant the divorce and attempts suicide that fails but nonetheless humiliates Yang and puts him in a state of emotional desolation. Compared to Li’s romantic individualism, which recalls May Fourth idealism, Yang’s intellectual subjectivization demonstrates more fragmentation and disillusionment in his symbolic gesture of “divorcing” the nation. Xiao argues that Wu Ruozeng’s and Su Tong’s divorce narratives accentuate a misogynist rhetoric that posits woman as the counterforce to the Enlightenment rationality of the male intellectual. Chapter 3 shifts the focus to the female intellectual subjectivities as embodied in Zhang Jie’s novella “The Ark” (1982) and Chi Li’s novella “Good Morning, Miss” (1998). In the former, three divorced or divorcing women live together to provide each other with mundane and emotional support while guarding against almost every man in their lives. “The Ark,” often applauded as the first piece of feminist writing in post-revolutionary Chinese literature, nevertheless reminisces about the socialist “iron girl” and perpetuates a direct correlation between sexual difference and socialized power, not unlike some 1980s male intellectuals’ gender imagination that was heavily influenced by the socialist revolutionary history. Chi’s novella tells an even more dramatic story in which three women wage a successful vendetta against a newly rich but unfaithful man. Replacing Zhang’s nostalgic revolutionary aesthetics with the new aesthetics of sentimental motherhood as mediated by market individualism, Chi promotes a new developmentalist modernity exemplified by professionally competent but culturally maternal women. Looking back at twentieth-century Chinese history through the lens of the female reproductive body, Xiao contends that the feminist writings of Zhang and Chi construct new familial ethics and national biopolitics through negotiations with the socialist tradition of women’s liberation and the bourgeois discourse of domesticated femininity. In Chapter 4, Xiao continues her exploration of the female accounts of postsocialist Chinese self-development and life-making by delving into the extremely popular TV drama Chinese-Style Divorce (2004). Penned by Wang Hailing, a renowned woman writer, the drama features the futile efforts by a middle-aged wife to save her marriage when her husband joins the middle class and asks her for a divorce. In this process the wife learns from her husband and, more important, from her mother and the younger women in her husband’s life that her lack of feminine qualities ultimately costs her her marriage. Discussing a variety of bodily and affective issues—e.g., self-development and self-ownership, the aesthetics of corporeal consum(er)ability, the function and limitation of the dialectics of (re)productive bodies—in the critical context of neoliberalizing China, Xiao suggests that family dramas such as Divorce promoted a new paradigm of domesticated female subjectivity that combines transnational middle-class culture and traditional Chinese ethics. The new paradigm is part of the neoliberal engineering of society’s affective labor. Moving from the small screen to the big one, Xiao proposes a new genre of postsocialist Chinese cinema in the last chapter. Depicting transgressive women divorcees across regions and ethnicities, the “cinema of divorce” suggests new possibilities of cultural nostalgia and female agency in the new millennium. In The Postmodern Life of My Aunt (Ann Hui 2006), Ye Rutang, a middle-aged woman who was sent down from Shanghai to Anshan in Manchuria during the Cultural Revolution, moves back to Shanghai to seek a second chance in both career and love after divorcing her factory worker husband. After experiencing bouts of disappointment due to the alienating effects of market-oriented Shanghai, Ye is forced to return to Manchuria and live a dull grassroots life in the postindustrial ruins of Anshan. Directed by Wang Quan’an, Tuya’s Marriage (2006) narrates the story of Tuya, an Inner Mongolian woman who remarries so that her new husband can support her, her disabled first husband, and their two children. Although Tuya’s behavior wins her a good reputation, she still struggles to perform her maternal and wifely roles on the less and less idyllic prairie. According to Xiao, the film genre depicts a largely futile effort by women to chase cosmopolitan dreams in the risk society of postsocialist China, where for grassroots people economic security is illusory and a bright future is eternally deferred. Combining insightful aesthetic understanding of literature and visual culture with a savvy engagement of knowledge from sociology and cultural anthropology, Xiao’s book presents important scholarship on the gendered reading of postsocialist Chinese modernity with a genealogical approach often “stemming from unlikely places, deploying transformed meanings in disrupted histories” (Anagnost 1997: 6). The time-honored aesthetic paradigm of “speaking bitterness” in Maoist China is recast in the context of neoliberal governmentality. From the 1980s romantic individualism, through the 1990s disoriented neorealism, and eventually to the new-millennium transgressive feminism, Xiao shows that the hegemony of male-oriented Chinese modernizationist subjectivity is constantly undercut by a variety of aesthetic interventions, many of which come from women. Compared to the inter-gender critique in the first half of the book, the second half of the book—particularly the discussions of female self-ownership, transgression, and corporeal consum(er)ability—demonstrates a growing consciousness of the author to break away from the increasingly formulaic victimization logics of the male (productive) and female (reproductive) bodies and reflect on the universal predicament of the human self and body under the unending pressure of neoliberal self-invention. Situating the aesthetics of divorce narratives within the interdisciplinary network of meanings informed by sociological (Anthony Giddens) and ethnographic (Ann Anagnost) studies, Xiao brings to the fore market, feminism, and consumerism as the three pillars to understand the aesthetic “engineering” of contemporary Chinese body and affect as a collaborative project of state neoliberalism and global capitalism. Overall, Xiao highlights the intertextuality and contextuality of China’s recent divorce representations and positions them within an analytical framework that interweaves new aesthetic paradigms with the historical context of economic marketization and social transformation. Works of under-examined authors, such as Chi Li and Wang Quan’an, are given long-overdue attention. Xiao demonstrates admirable familiarity with scholarship on twentieth-century Chinese cultural modernity, which is exemplified by, among other things, the cleverly crafted section titles and critical terms such as “diary of a middle-aged (mad) man” and “revolution of the womb (heart).” She persuasively delineates the cultural continuity between the postsocialist structures of feeling and those of the Mao era; as such, she has constructed an eloquent counterdiscourse to a somewhat popular-but-questionable academic practice that takes the “post”-ness of Chinese postsocialism too literally. The book also includes two lists of recent TV dramas and films about divorce, a comprehensive bibliography, and index, making it very helpful for both researchers and students. Family Revolution largely succeeds in rejuvenating feminism as a framework to critique the structural inequality and discursive hegemony of China’s modernity. In the Chinese age of de-sublimation when pure literature and serious films have yielded the control of mass mind to a variety of multimedia and entertainment-oriented aesthetic forms, the narration of divorce, together with emerging genres such as new urbanite fiction (Tang 2000) and ecocinema (Lu and Mi 2009), reminds the Chinese masses of the human body as the last inspiring resort to construct meanings and conduct life at, as Anthony Giddens and Francis Fukuyama respectively note, the ends of nature and history. Anagnost, Ann. 1997. National Past-times: Narrative, Representation, and Power in Modern China. Durham and London: Duke University Press. Lu, Sheldon. 2007. Chinese Modernity and Global Biopolitics: Studies in Literature and Visual Culture. Honolulu: University of Hawai’i Press. —— and Jiayan Mi, eds. 2009. Chinese Ecocinema: In the Age of Environmental Challenge. Hong Kong: Hong Kong University Press. Tang, Xiaobing. 2000. Chinese Modernism: The Heroic and the Quotidian. Durham and London: Duke University Press.